The US state of Oregon has no sales tax; no VAT. It has federal income tax (your $ to the Iraq war), and state income tax (your $ to fund other things but not healthcare). All highway tax comes from cars and their use. Car registration is something resembling background noise, $27/year, compared to the couple-of-hundredish pounds in the UK depending on your pollution levels. Fuel is free, if you drive a european car that does over 35 miles per US gallon (about 4 litres). Well, effectively free: $1.60 in 2000, which was about 25 pence a litre; now it is $3/gallon. And the reason fuel is so cheap? Not much tax. This doesn't help funding for road maintenance, which is a shame, because with their very wide roads, they have a lot of maintenance. 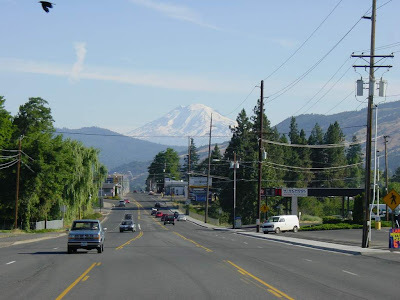 Here is Hood River, Oregon, looking north towards the volcano Mount Adams. There's no bike lanes here, but there is a 25 mph speed limit. Lots of the vehicles have wasted the benefits of the effectively-given-away petrol, "gas", by driving woefully fuel inefficient V6+ engine'd pickups, many of which only do 12-16 mpg. Which means their cost/mile is a lot worse than it could be, and, with big distances between places, cost/commute is high. Now, what could this state be worrying about? Could it be concerned that the primary water supply during the rain-free summer months? After all -water for agriculture, the very profitable pacific salmon fishing industry, and for the residents- comes from meltwater from those mountains. If the precipitation between November-March in those mountains falls as rain, not snow, it won't stay in the hills, it will go out to sea. No water, no agriculture, and, without the hydroelectric power, no electricity. Google have a datacentre about 20 miles to the east of Hood River, hydro powered; Microsoft and Yahoo! are upstream in Yakima, not far from the Hanford Reservation where the Manhattan Project used electricity from those same dams to run the centrifuges of the planet's first nuclear weapons factory. Downstream the big Intel Hillsboro foundries build the CPUs found in most PCs. Again, they are based here for electricity. The state's businesses: logging, agriculture, fishing and high tech all depend on that water. 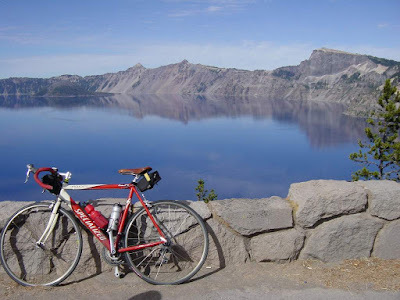 Which means that you'd hope the local state would be copying California and trying to be leading the way in fighting global warming, cutting back on energy wastage, trying to encourage the growing cycle users and cycle industry to move Oregon forward. That would be a mistaken assumption. This is a state where you can end up harassed just for being in the way of cars. Not for stopping them get past -just for forcing them to swerve into the (empty) oncoming lane to get past. Because it is not only an affront to the car drivers to force them to use the steering wheel, it is a sign that bicycles are starting to win the battle between bikes and cars, even in car-centric countries. Increasing popularity of bicycles would hurt state revenue from gas tax. They already have a problem: more people have started driving fuel efficient EU and japanese cars, which is not only driving the US car manufacturers into bankruptcy, it is impacting state income. This is why they are thinking of taxing cars per mile, ignoring fuel economy. "gas tax revenue is down $4.8 million a year compared with 2006. That drop, caused by lower fuel consumption and a slowing economy, has prompted Oregon to consider a new way to pay for road repairs: Democratic Gov. Theodore R. Kulongoski's upcoming budget calls for a highway tax based on mileage, not gasoline purchases. A state task force will look at equipping every new vehicle in Oregon with a Global Positioning System to record every mile driven and where. Motorists would pay at the gas pump based on how much they drove, no matter how fuel-frugal their vehicle"
Such a mileage tax would remove the unfair advantage that low-fuel consumption cars have over US vehicles, stop the drivers of the V8 Dodge pickups paying more than drivers of VW Polos (which VW are planning to introduce to the US this year), and stop electric cars dodging paying gas tax entirely. These people are all fuel-tax-dodgers and should be banned from the roads? What about bicycles? They take up space? They get in the way. They wear down the tarmac. This is why four of the state senators are proposing a paying the same $26/year for a bike as you do for a car. Own more than one bike -pay more -even if it is a mountain bike you never take on-road. Only motorised quad-bikes will be exempt, as they don't get in the way of cars. This will force the bicycles to pay their way, and help discourage more people from using un-american forms of transport. This is very fair and deserves support. Because once you pay for the right to use those roads, explicitly, you can use them -which means when you encounter conflict issues with a car/pickup, you have someone to call. We need something like this in the UK, so that the Association of British Drivers will have to stop complaining about unpaying bicycles being in the way. Although we think it should go further -cars, bikes and pedestrians should have different coloured registration plates (yes, pedestrians need to be registered too), showing whether they were a net contributor to the country, or a net expense. It's not enough to measure tax paid, you have to look at how much suppor the government has had to put into keeping your bank afloat, how overcommitted you are on a mortage. All these details need to be added up before the government can decide if you benefit the country enough to get the right of way at junctions. Also: we need mountains like the ones in the pictures. They are all volcanoes -Mt Adams, Mt Hood and Crater Lake- so could be installed in undervalued country to create new ski resorts and better scenery in England. 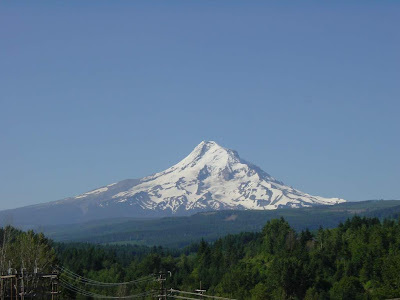 Nice to see a picture of Mt Hood - I'd wondered what it looked like since I read Ursula Le Guin's 'The lathe of heaven' in which it has a cameo role. That book was written in 1972 (?) and an interesting point is that it features a future world in which irreversible global warming has happened. Le Guin is even more specific about warming in 'the disposessed', also written in the early seventies. Oh dear, I sound like a weird literary tree-hugger. What is the relevance to Bristol cars? Carbon emissions. We've known about this for a *long* time. The personal is the political. Prisoner's dilemma. Categorical Imperative. Et cetera et cetera. If you've ever watched the Shining, it's the mountain behind the hotel in all the exterior shots. Good bike ride up to that hotel. It is a dormant volcano; some bits near the summit you have to avoid when climbing as the sulphur gas is poisonous.